Water is not your pavement’s friend. Poor drainage on any paved areas can lead to all kinds of expensive, ongoing maintenance issues. Water seeping down into the subbase can expand and contract during winter’s freeze/thaw cycle, gradually breaking up the pavement and widening cracks or causing full-blown potholes. Standing puddles are a sign that the pavement is not even and not draining properly. So if you are starting a new business and having your asphalt paving company install parking lots and driveways for the first time, make sure they arrange for proper water drainage. If you already have a drainage problem, contact Espina Paving and we can fix it before it gets worse and more expensive. This is really the key to successful, money-saving asphalt paving. 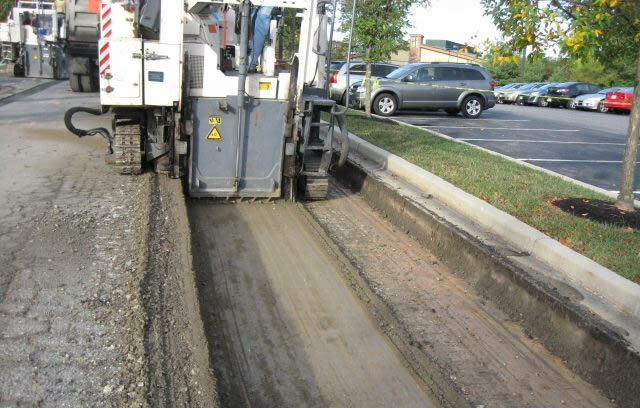 Your commercial asphalt paving company should be very thorough with the drainage preparations and the subbase installation before any asphalt is installed. They should ensure that the subbase is well compacted to provide a smooth, stable, long-lasting surface for the asphalt. We keep coming back to drainage; it’s that big of a deal. Espina Paving can install new, environmentally-friendly porous asphalt that is just as durable and smooth, but that allows runoff water to filter down through the asphalt and cleanly back into the water table. Many communities here in Northern Virginia consider this a “green” paving solution and there may even be tax credits available for businesses who have it installed. The porous asphalt solution also reduces the need for (and cost of) building extra drainage structures. So it’s a good way to save money long-term. Choosing a reputable contractor is really the first step to getting the best money-saving value and the highest quality asphalt paving job. Choose a commercial asphalt paving contractor that has a good reputation, is licensed, bonded and insured and that has been doing business in the area for a long time. They should also have extensive experience doing larger commercial paving jobs—not just residential driveways and patios that have very different requirements. A regular sealcoating schedule (suggested every 1-3 years, depending on climate and traffic)—Sealcoating prevents small cracks from becoming big ones by regularly protecting your asphalt from water, UV and pollutant damage. Sweeping and cleaning services—Removes corrosive pollutants and damaging debris and serves as a regular inspection service to catch small problems before they get big and expensive. Crack filling and repairs—If you catch small cracks early, we can usually fill and repair them at relatively little expense compared with bigger cracks and potholes. Pothole repair—If a crack does become a pothole, we can still make repairs before the damage gets worse and more costly. Don’t be afraid to ask for bids from several different asphalt paving contractors. And then, don’t be afraid to ask a lot of questions from each of the candidates. Make sure they give you a very thorough estimate – the more detailed the estimate, the fewer surprises there will be. These steps are necessary for finding the contractor that will provide the best value for your business and save you more money in the long run. Asphalt paving and maintenance are essential property management issues for any business—choosing the right contractor and being proactive can really stretch your budget a bit further and make your clients happier as well! Contact Espina Paving at (703) 491-9100 today for a consultation.